“So, where’s Home for you then?”. This simple question got me thinking, asking myself what this little word really means. Is it a place I rent? Does the security or duration of my tenure make a difference? Is it anywhere I feel is the ‘right’ place to be? Is it even a place at all? This thought struck me as I looked out of the window at a friend’s place that he rents in north Wales. I realised I feel very much ‘at home’ in this rural, rough and functional, beautiful, thinly-populated kind of place. It’s forming the theme for a small series of paintings, starting with that window, with the bright, paper, sailboat or kite on the window-ledge. The ideas of “owning” and “home” remind me of a teaching discussion I had, several years ago, with the Ven. Kusalo, a theravadan Buddhist monk who was staying in the area at the time. He questioned the notion and true nature of “ownership” …. “Think about what it really means in practice…” His approach to it was, if you are maintaining mindfulness, wherever you are is “home”. He went on to explain that, in that period of time you can enjoy and appreciate it in just the same way as the legal “owner”, so where is the difference? Indeed possibly you can appreciate it more because you are free of the associated burdens of cost, taxes, maintenence and the worry of security and potential loss; accepting its impermanence in your life allows you to move on when you leave and “own” something else – the bus stop, station, your own lodgings, mansion or flat. I’m writing this in a lovely bungalow by the sea. For a long time it was “home”, though it “belongs” to a good friend. I live now in a city inland, following the work, in a small flat that I rent; I do feel more at home out here on the edge of the land, though. And, for now, until I leave in the morning, it is…. The view from my room in a place I still feel very much at home . 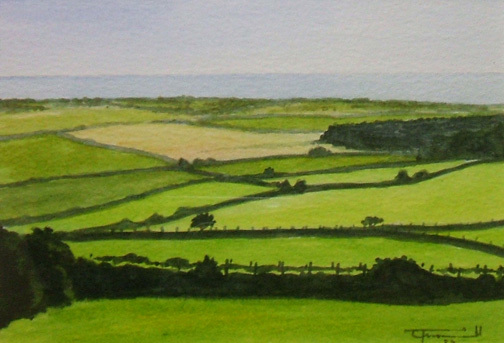 When I lived there, and each time I visit, I always find this view fresh and absorbing, though I only painted it once. It’s Friday, the end of a busy week, before returning to the flat, a cup of tea at the supermarket cafe. Have you ever listened, just listened, to the sounds of supermarkets? It’s quite restful, really, an unintentional lullaby for stressed shoppers – if they pause from being stressed and just bring attention to noticing what’s happening around them? The bleeping of the tills makes a sort of call and response across the queueing lines. Here there are about 3 different notes, sometimes coinciding to make a simple, one-time, melody of bleeps. It might make a good starting point for an improvisation. I begin to wish I had a good quality, discreet, microphone to record it with; my phone will only pick up low quality voice memos. A project for another time… as if I was ever bored! So I just listen to the sporadic, unpredictable, melodies and the fragments of words and conversations, the sounds of packaging and trolleys, of parents and children, until my cup is empty and I remember that I have an early start tomorrow. Tonight, I am burning diaries, steadily, in the wood-burning stove at a friend’s house. It is a dark, drizzly night and I am alone here, at the end of a steep track that branches off a narrow side road. I have no music nor radio nor television playing to distract me from the process of burning old papers, no alcohol to cloud my thoughts or allow maudlin emotions and memories to clutter my awareness of what is happening, now. Here goes one, the pages rolled tightly so they burn more slowly, more usefully, in the stove, giving warmth to the teapot on top and heating a chilled room; memories become tongues of flame and delicate grey ash. That was the year I took a change of direction, a new career began, full of trepidation and optimism, only to change again. These are not detailed accounts, but short notes, appointments, reminders of things to do, bills to pay, brief notes and smiley face cartoons from parties and pub sessions and gigs and days when the surf was good – two stars for New Year’s Day, that was a good start to the year! Shame the good old faithful car met its end and had to be replaced, another hole in the bank account! And in this one is the year of lots of small, amazing things. A year when, despite uncertain times, enough work came up at just the right time. A lot of good days on the beach, I caught some good waves that season. One time, I even had a little razorbill come and swim underneath me, catching fishes while I waited for the next wave. Another day, a pod of dolphins cruised by, two hundred yards further out, as I floated there, the only one out on a pristine morning. That was the year, too, when I fell in love again, another time of brief hope and moments of joy; the scribbled notes and shorthand for your name, detonators for memories and emotions that burst back into my mind like bright fireworks in a winter night. I murmur a brief farewell as I put the roll of pages into the glowing pile of cinders. I notice, in this meditative state, the tugs of attachment to these papers, these tangible records of rememberences, as though small hands were reaching out to cling to my fingers and prevent me throwing them into the fire. Small voices pleading to “keep me for a little longer”, amidst the clutter of my life so far. A monk in India, over two thousand years ago, had four profound insights, in the second of which he understood that the root cause of all our suffering and discontent is desire and craving for something different or something fixed, dependable, permanent; an object, a person, a situation, a quality, a state of being, an emotion, a belief. He realised that this craving leads to attachment, emotional clinging to “things”, including memories, and that this only results in sadness, discontent, frustration, desire and many other negative emotions and actions. He taught that, only by releasing oneself from this attachment could one attain lasting happiness, equanimity and contentment. The delicate leaves and petals of what was once paper, ink, graphite, now glow and sparkle along their edges, the shapes changing as the remnants dissolve into gases, water vapour, soot, grey ash. There is no memory in that, only elements returning to air, water, earth, by way of fire. Releasing the papers into their dissolution and transformation, I enjoy the heat and light and soft sounds, memories fading a little, the clinging hands and small voices losing their grip. But I am still here, releasing small burdens. Tonight, I am burning diaries. Spring seems to be happening quickly, this year. New leaves, and blossom blowing on the breeze. I feel a renewed sense of clarity in what I am aiming for, both personally and in my work and paintings; perhaps I will say more about these in a while. The last version of this blog, deleted now, began with the aim of airing thoughts about education and learning. This one is intended to be a bit more personal, reflections on personal experiences and insights, ideas that I’ve considered might be of interest to others.